Waiting sound system to respond. I sending a screenshot with error message. Please don't run gnome-volume-manager. It's functionality is deprecated by gvfs, completely unmaintained, and likely to cause more problems than it solves. gnome-volume-manager is going to be removed from the archive soon. You actually assigned this to the wrong package. Your screenshot shows gnome-volume-control, which is a completely unrelated piece of software. Please post the output of "gnome-volume-control --debug"
Yes, because pulseaudio full blocked with Orca Screen Reader. when accessible profile is selected during installation. gnome-volume-control starts correct, I don't no why? Hi, I can confirm the same problem in my machine. I run gnome-volume-control from the system/preferences/sound menu. happen when I booting the live cd and choosing accessibility profile. 1. I choose default language, and press enter key. key. After this I press enter key. 3. Press enter key again, the system begin booting. because not talking by default. present, the application waiting the sound system response. I am having the same issue on my Asus eeepc-900A. Removing Pulseaudio doesn't fix the issue. I had to remove pulseaudio because it's been very unstable and started giving me kernel dumps on Karmic. Therefore I had to remove it and got a similar problem. Interestingly, these applets show up when called on the fluxbox ! 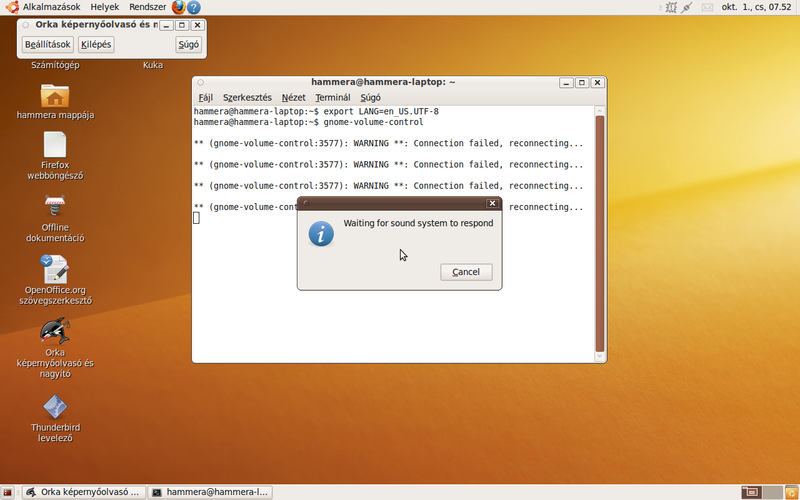 Now gnome-volume-controll will not start, same error like Jackphone posted above. Then I used "fakeroot make" with checkinstall to compile it. I can now run gnome-volume-control with oss and/or alsa mixers... However, I still get problems with most of my gnoem applets on GNOME! Nevertheless, haven't had any system locks (which most likely were due to pulseaudio server) ever since I removed the package. I have re-compiled the relevant GNOME packages for users who can't or don't want to run PulseAudio.